I like the details you put into the folds and seems on the jacket and jeans! That's a tough one! I really like doing both! I think I'd rather swim with dolphins, but because I can go hiking pretty much anytime. Dolphins aren't easy to come by as far as swimming goes. Would you rather go to a job interview without makeup or without underwear? LOL! Tell me about your ex? I love her rainbow hair! Awesome concept and execution. The moon gems and the lotus are my favorite of these. Very well done and original. I checked out the original and love the face editing! Still in love with the colors and those folds. I'd take a puppy, only because I think goats would be to wiggly. Would you rather draw/pixel for 24 hours straight, or take a week off from any sort of art? That sunset is fantastic. I love the colors in the clouds and how realistic the sand looks. +10 for Skiploom; I love grass types. The Church- "Under the Milky Way Tonight"
I'll take the traffic. It takes me almost that long to get home from work for the same reason. Would you rather smell bad personally, or just think that everything around you smells bad all the time? Topic: How have I forgotten how to shade!? Re: How have I forgotten how to shade!? We may be in the same boat! 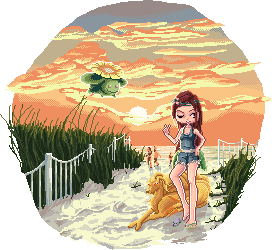 I haven't tried my hand(s) at pixeling for a long time after breaking both, but I'm back on board to give it a shot. Here's hoping to get back in the swing pretty fast, for both of us! Topic: back to tooling?? E'DIT: another tool shaded re-dool! Re: back to tooling?? E'DIT: another tool shaded re-dool! I really like the pallette that you chose for the first girl's green dress. Everything flows and looks very soft, yet defined. Topic: I am on Hiatus! Re: I am on Hiatus! I am attempting to quit hiatus and return. This is a very cool concept, and the colors are amazing. Good luck in the contest!! I might be making a few of these for the next few weeks.